How our mattress was silently affecting our health. The many reasons why I ended up throwing out our 6 year old mattress and replacing it with an intelliBED. Kevin and I treated ourselves to a new mattress when we moved into our first home together, 6 years ago this summer. We did what all couples do when they’re in the market for a new mattress – we gathered up a list of department stores and proceeded to test out a bunch of beds until we agreed on one. By the end of the process, various salespeople had educated us on optimal sleep positions, pocket coil, memory foam and the like. We found one that we loved – it was comfortable, just the perfect amount of firmness, and we arranged for it to be delivered to our new home. We’ve been sleeping on it ever since. Fast forward 6 years. My closest girlfriend tells me she’s just been diagnosed with hyperthyroid; being fearful of the conventional approach to things (aka radioactive iodine), she enlisted the help of a Naturopathic Doctor to aid in healing. “Mattress? What does a mattress have to do with thyroid health?” I asked. And she filled me in. Oh, did she ever. This mattress conversation was the start of an intense 4 months where I became hypervigilant about the toxins in my life and the impact that they could be having on my family’s health. The mattresses we’re sleeping on are comprised of synthetic materials that are wreaking havoc on our health, slowly and silently. Every night, the chemicals from these synthetic materials evaporate into the air and are inhaled hour upon hour by the person sleeping on the bed. Boric acid, used to kill cockroaches. Antimony, more toxic than mercury. In this 2008 article, the chemicals that make up PBDE’s (a type of flame retardant) were subjecting sleepers to continuous exposure from the mattresses they were sleeping on. 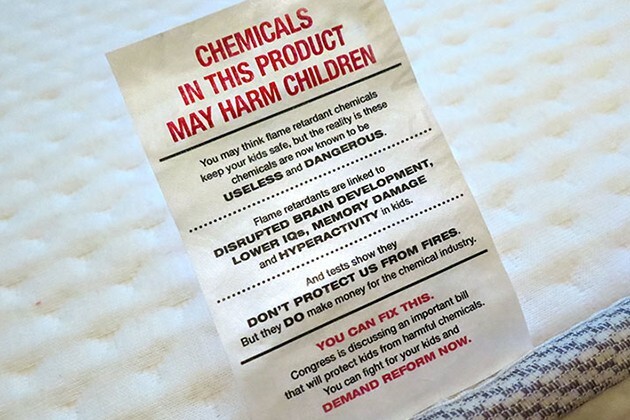 Many of the governments that made mattress PBDE’s mandatory are retracting the mandate but haven’t defined rules and regulations on safe flame retardant options. While PBDE’s are banned in many countries, the combination of chemicals that make up a PBDE are fair game. Not to mention the foam (often memory foam) used on the tops of mattress that can also pose a health risk [source] by releasing VOCs into our bedrooms. My question: what good is saving your house from burning down (that’s assuming you smoke in bed…) if your mattress is contributing to your toxic load every day of your life? Increased risk of miscarriage, premature birth, headaches, insomnia, fatigue, excessive thirst, respiratory imbalance, reproductive damage, liver damage, kidney issues, cancer, nervous system disorders, lung cancer, allergies, weakened immune system, autoimmunity, . And VOCs, a very real concern related to memory foam or foam-topped mattress can cause a slew of additional issues [source]. In the case of your thyroid, these toxins are believed to mimic thyroid hormones, causing an imbalance. Although studies have only been done during pregnancy [source]. All references and sciency stuff aside, it’s pretty simple to me: the mattress we were sleeping on was toxic. And; while I didn’t think I was experiencing crazy side effects, I’ve learned that if there’s something in my life that’s concerning it’s better to remove that thing than waiting for it to affect me. I wanted a safe, non-toxic mattress to make sure that I wasn’t inhaling toxic fumes when my body was resting. In addition to many of the resources out there on sleep and toxicity, this article helped me make my decision to switch to intelliBED [resource]. I wanted to keep my spine aligned and supported to achieve better posture and structural support during the day. While I don’t have chronic pain, I have many clients who do and; when they look back on things, wish they’d taken better care of their body long before now [resource]. 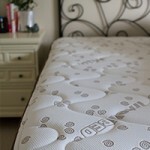 Get a toxin-free sleep with intelliBED and get free shipping, free sheet set, free mattress cover, AND a 10% discount! Kevin and I weren’t expecting to be wowed with change when we made the switch. 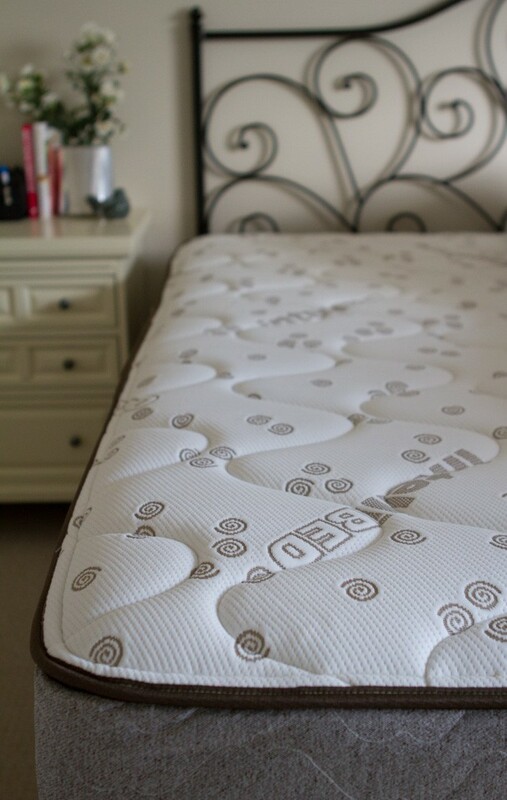 For us, trading in our mattress for an intelliBED was all about reducing our toxic load and less about comfort, supporting joints or improving our sleep quality. And, truth be told, we felt like the quality of our sleep was pretty bang on before making the switch. Uninterrupted sleep. I used to wake up every time Kevin got out of bed (at 3am every morning to go to work). Now, I sleep through the night and wake up naturally around 7am. No night sweating. We toss and turn pushing the blankets to the foot of the bed, especially in the summer. This has not been an issue with our intelliBED. Heat doesn’t trap under the foam (because there is no foam) allowing air to flow freely, leading to a cooler sleep. No headaches. Kevin experienced morning headaches every single morning. He sets a tylenol on our bedside table the night before just so he’s prepared when he wakes up. He hasn’t had to do this since we started sleeping on an intelliBED. No throat clearing. Kevin has been clearing his throat ever since we moved into our new house. Usually in the early afternoon, every day. It goes away when we travel, comes back when we get home. 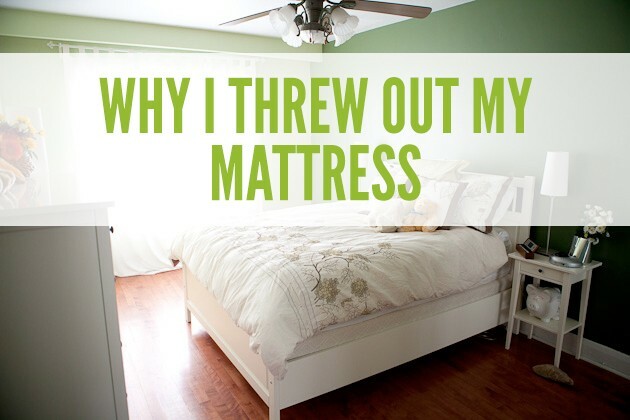 We always thought it was something in our house, but it’s clear it was the mattress. No hip pains. I had thought that my constant hip pains were because of my office chair. I’m sitting in it now writing this and my hip is as happy as can be. The pain went away 3 weeks ago and hasn’t returned. We didn’t think that the headaches, throat clearing and hip pains were being caused by our mattress, but it’s SO clear now that they were. Create a toxin-free sleeping environment with intelliBED. The intelliBED team has been gracious to offer the Healthful Pursuit community free shipping, free sheet set, free mattress cover, AND a 10% discount!. I wish I’d known the mattress story. I wish I’d asked the right questions when we were visiting department stores so that I could have made a healthy choice for me and my family. What upsets me the most? These companies don’t have to specify what flame retardant they’re using, they don’t have to educate salespeople on these ingredients (which explains why no one is talking about this), and they can claim that their mattresses are “healthy” and “good for you” when they’re straight-up not. I hope by sharing my story – how I learned that our mattress was silently affecting our health and the many reasons why we sleep on (and love) our intelliBED, that you can make a well-informed choice for you and your family. Get the scoop about intelliBED and how it can change your health.